Bihar, of which the new state of Jharkhand was a part until recently, is an important state in every respect: population, history, religion, geographical position, economy, mining, and politics. Bihar and Jharkhand are surrounded on the north by Nepal, on the east by West Bengal, on the west by Uttar Pradesh and on the south by Orissa. 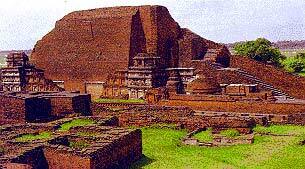 Bihar and Jharkhand find mention in the Vedas, many Puranas, and ancient Buddhist and Jaina literature. Places in Bihar such as Gaya are associated with Gautama Buddha and the birth and spread of Buddhism throughout the world. It is home also to the Jaina Tirthankaras. In Indian history throughout the ages, Bihar played a very crucial role. Mahatma Gandhi's first experiment and encounter with Truth happened in Champaran, Bihar. This changed the entire political scene in India, and led us to independece. He wrote: "It is no exaggeation but the literal truth to say that in this meeting with the peasants I was face to face with God, Ahimsa, and Truth" (cited in Mohammad Ayaz Alam, 2003, Ayaz n' his own world, http://www.geos.iitb.ac.in./~ayaz/champ.html). Bihar and Jharkhand formed part of the Bengal Presidency till 1911, when on 12 December 1911, a separate province of Bihar and Orissa was created. 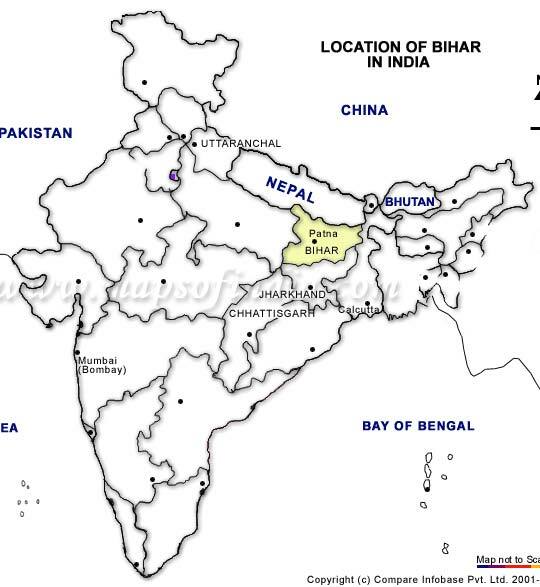 In 1936, Bihar was made a separate province. Bihar and Jharkhand have a total geographical area of about 173.30 lacs hectare. In the twentieth century, the tribal and non-tribal population of Jharkhand raised a demand for a separate Jharkhand state. As a result, the political boundaries of Bihar were re-drawn carving Jharkhand out as a separate state. These two states have a population of 8,63,74,465 persons according to the 1991 Census of India. Hindi is the regional and official language of both these states, which is spoken by 79.34 per cent of the population. The major linguistic minority groups in these states include the speakers of Urdu (10.42%), Bengali (3.18%), and Santali (3.09%). The minority language speakers who constitute less than 1 per cent are the speakers of Kurukh/Oraon (0.98%), Mundari (0.87%), Ho (0.76%), Oriya (0.54%), Punjabi (0.15%), Kharia (0.14%), and Malto (0.13%). The speakers of minority languages who constitute less than 0.09 per cent are the speakers of Munda (0.07%), Telugu (0.06%), Gujarati (0.04%), Gorkhali/Nepali (0.03%), Malayalam (0.03%), Tamil (0.03%), Bhumij (0.01%), Marathi (0.01%), Sindhi (0.01%), and Arabic/Arbi (0.01%). 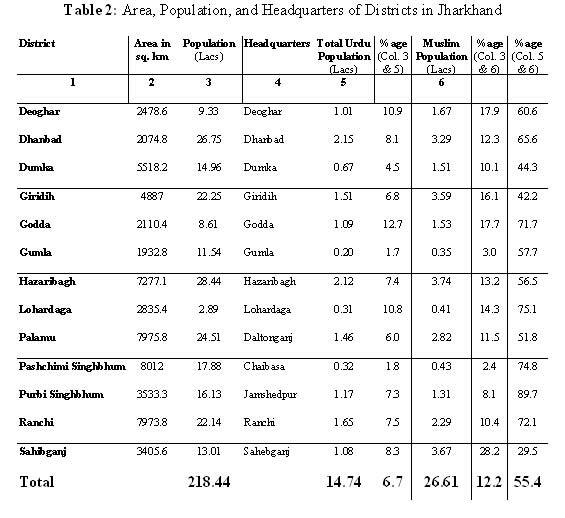 The names of the districts along with the actual percentage of population, districts headquarters, and the total Urdu population are given below in Tables 1 and 2. Acceptance of representations and replies thereto. Acceptance of documents by the Registration Offices. Publication of important rules, regulations, etc. Issue of orders and notifications of public interest. Publication of important Government documents. 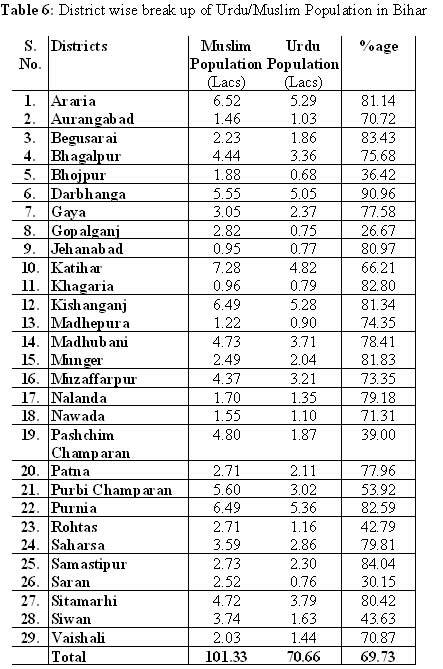 A detailed district-wise break up of the total Urdu population in Bihar and Jharkhand is given below in Tables 3 and 4. 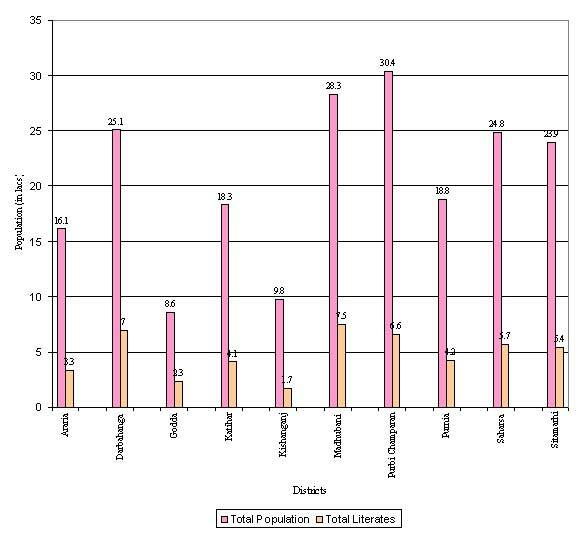 A rural urban division of Urdu population is shown diagrammatically in the following charts. Four districts have 4-5 lacs of Urdu speaking population. Most of the districts have above one lac of Urdu population. Araria, Darbanga and Purnia have over 5 lacs of Urdu population. Urdu in Bihar and Jharkhand states is mainly a rural-based language. Chart 1: Rural and Urban Division of Urdu Population in Bihar. Chart 2: Rural and Urban Division of Urdu Population in Bihar. As shown in Chart 1, 85% of the Urdu population in Bihar is rural, while in Jharkhand 64% of the Urdu population lives in rural areas. In the light of these figures we may say that Urdu has a rural flavor in Bihar and Jharkhand. 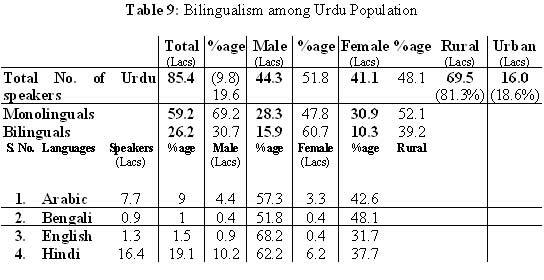 As shown above in Tables 1 and 2, the distribution of Urdu speakers is uneven in the states of Bihar and Jharkhand. It is uneven over the various districts within these states. To show this uneven distribution, top ten districts of Urdu population in Bihar and Jharkhand are identified and presented below in Table 5. 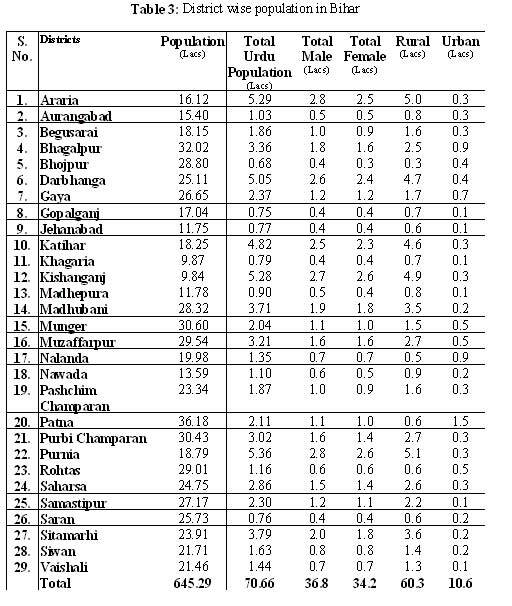 As shown in the table above, the districts of Bihar and Jharkhand show variation in their numerical strength. On the basis of this statistical variation we may identify top ten districts of Urdu speaking population in these states. Five districts from the top ten selected districts have a concentration of Urdu speakers over 15 per cent of the total population. District Kishanganj has an overwhelming population of 5.3 lacs (Urdu speakers) that constitute 54% to the total district population. 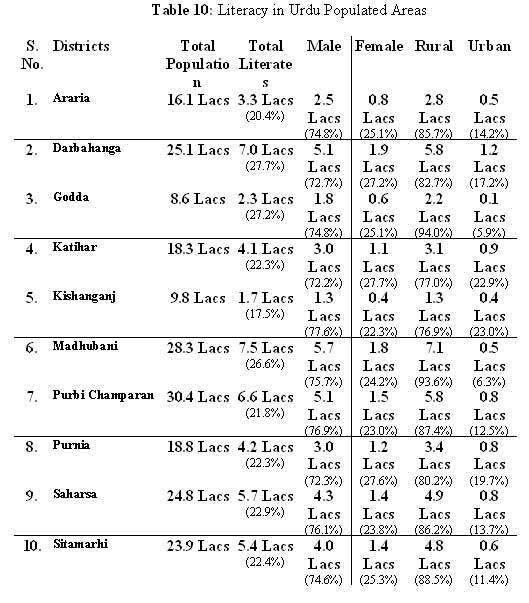 Araria (33%), Purnia (28.5%), and Katihar (26.3%) occupy numerically the second, third, and fourth positions respectively. These ten districts are also represented below through a frequency chart (Chart 3) that shows a clear difference between the total population and the Urdu speaking population. Urdu is normally associated with Muslims and taken as an icon of Muslim identification. In the present study, an attempt was made to evaluate the validity of this statement. 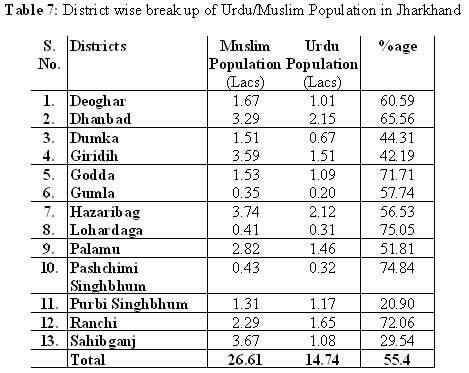 The district-wise break up of the Muslim population and the Urdu speakers are given below in Table 6. The district-wise break up of Muslims as well as the Urdu speaking population presented above in the tables refutes the belief that Urdu is an icon of Muslim identity. In Bihar 66.7% of the total Muslim population claims Urdu as their mother tongue, but (43.3%) of the Muslim population claims other language/s as their mother tongue. In view of this fact we may say that although Urdu is closely associated with the Muslims of Bihar and Jharkhand, not all these Muslims of these states prefer to claim Urdu as their mother tongue. In the Indian demongraphic studies mother tongue declaration is always given importance as it reveals possible shift in social identification in changed circumstances. An analysis of the decennial growth helps in displaying any shift in the attitude of any linguistic community. To review this information, the table given below presents the decennial growth of Muslims and Urdu speakers in the states of Bihar and Jharkhand. from 1971 through 1981 to 1991. An analysis of the figures given above reveals that there are slight decreases in the growth rate of both Muslims and Urdu speakers. The growth of Muslims goes down from 23.10% in 1971-1981 to 22.78% in 1981-1991. However, the figures of Urdu population suggest that there is a noticeable downfall in the growth rate of Urdu speakers in the states of Jharkhand and Bihar. From the growth rate of 28.21% in 1971-1981 it slides down to 18.57% in the decade 1981-1991. The sliding rate is rather significant. Is this a continuing slide, or a transitional one, only for this decennial period? What reasons could we adduce for the slide? How is this change related to the extent of facilities available or unavailable for the study of Urdu in schools? The graph given below indicates the sliding growth rate. It is significant to note that in the period from 1951 to 1991 the number of literates in the age group of 15 years and above rose from 42 million to 259 million in India. The six-fold growth in the number of adult literates in forty years can be attributed to the success story of literary programme organized by various governments, especially the most recent Literacy Mission Program. As stated earlier the literacy level is directly linked with the urban:rural and male:female factors. In Bihar and Jharkhand the average level of literacy is 30.56%. In order to find out the level of literacy among Urdu speakers we compare this figure with the Urdu speaking districts of the states under study and find out that the level of literacy is below the state average. The table given below presents the figures of literates in the top ten Urdu speaking districts of Bihar and Jharkhand. According to the Census of India 1991, 74.30 percent of the total population of India lives in rural area. It is very encouraging to note that in Bihar and Jharkhand the literacy rate is higher in rural areas than in the urban areas. The minimum rate of literacy in rural areas starts from 76.9% and it goes up to 90%. But, unfortunately, the literacy rate in the Urdu speaking areas in the state is only 27.7%. Education occupies an increasingly important place in people's lives as its role in the modern society. Educational system in India is changing fast. In this section we make an attempts to analyze the level of education in theUrdu speech community of Bihar and Jharkhand. The ten top districts of Urdu-populated areas are taken to examine the level of education. The details of the level of education are given in the table below. 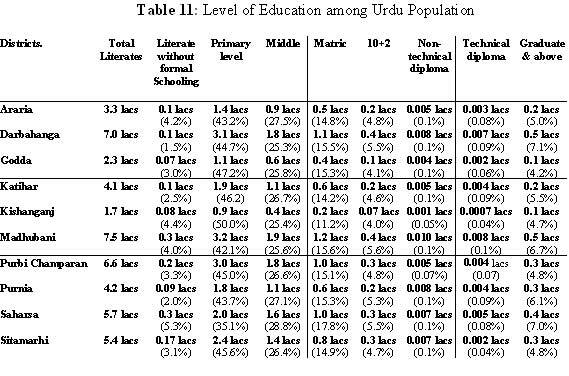 An analysis of the figures given above indicates that 35 to 45% of the literates have formal education only up to the primary level. In other words, they do not carry their study beyond the primary level. Only 15% of the literate population of these districts up to high school level goes beyond this level. At the college level, the percentage goes down to 6 percent. The figures presented above further suggest that there is a need to improve the level of education in Urdu-speaking areas of Bihar and Jharkhand. 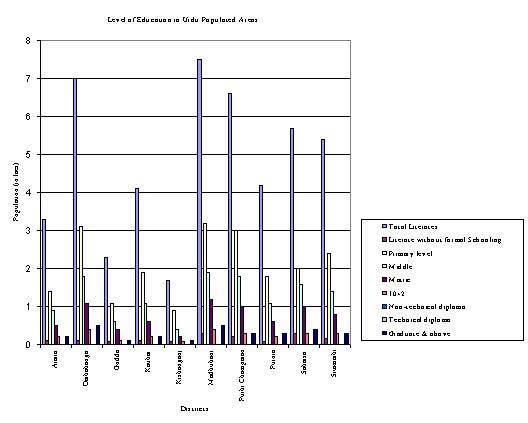 In the chart given below the level of education in Urdu-populated areas is displayed. In Bihar, students may choose one of the recognized mother tongues, namely, Urdu, Bengali, Oriya, Nepali, Santali, Mundari, Ho or Oraon at the Primary stage of education, provided that in a class 10 students choose to study through one of these recognized mother tongues, and that at least 40 students in the school so desire. The regional language is taught from the Primary stage in almost all the schools, that receive financial support from the Government. The total number of languages used for instruction at various levels in these states is presented below in Table 12. The future of Urdu in Bihar and Jharkhand is secure, but the speakers of this language of common people need to get involved in its further development as a language of wider communication. It appears that while spoken Urdu is being accepted, written Urdu faces problems for its spread among the various sections of people in Bihar and Jharkhand.